This is the Caribbean element of my barbecue dry rubs repertoire, there are two rubs to choose from, they're both quick and easy to prepare and bring the Caribbean to life in your backyard barbecue. All that’s needed to complete the experience is a white rum cocktail! It’s all too tempting much of the time to put lots of spice into barbecue dry rubs and blow everyone’s head off, the classic being a jerk seasoning. This first recipe is much more gentle and if you prefer fruit to heat, then it’s definitely the one for you and it works great on chicken. The citrus elements together with the sugar bring you that sweet and sour flavor that we all love and then there's more spice to overlay. The spices will also blacken and add a lovely deep color to the finished results. It's actually more of a paste than a rub because the herbs and spices are mixed up with the freshly squeezed fruit juices. Just throw it all together and give it a good mix to form a paste. If you are going to use this one on chicken, make sure that you remove the skin from the chicken first so that you can really let the paste penetrate the flesh. Once you've applied the paste, let everything rest for an hour and then you're ready for the grill, medium hot coals are perfect for this one. 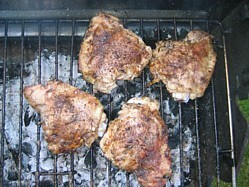 I love this jerk seasoning rub on barbeque chicken thighs although any meat will be transformed instantly. Jerk seasoning originates in Jamaica and traditionally is very hot with the introduction of scotch bonnet peppers to the mix but on this occasion I’ve decided to keep the “fire” under control and bring out the more subtle herb and spice flavours. Not only does the term jerk apply to the seasoning it also refers to the type of cooking which is very much in line with our own passions. Jerk food is typically cooked over fire pits or more recently old oil drums that have been cut in half and hinged so that they have a lid. Getting that smoke flavor into the food is all part of the jerk cooking process. 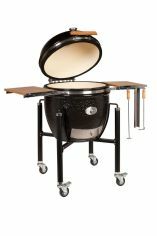 So provided you have a charcoal barbecue with a lid then the true jerk flavor is right here for you to experience. As with all barbecue dry rubs, this one is very easy to throw together and all you’ve got to do is rub it on! The only ingredient to concern us here is nutmeg although I've found in difficult to get a definitive answer on whether nutmeg is actually a nut (and should therefore be avoided if you have a nut allergy). Technically it's the dried seed of a fruit and not a nut. That said, if you're worried, seek professional advice. Break out the airtight jars, throw all the ingredients into a jar and give it a cocktail shake. Job done. Sprinkle the seasoning over your meat and rub it in, give it 30 minutes to take hold and then you are ready to grill. Remember, life in Jamaica is in the slow lane so take it easy, stretch out in your hammock and enjoy a Caribbean cocktail. Now where’s that bottle of rum…………. ?